I’d like to thank my family, friends, colleagues and neighbors who made my birthday very very special. On the day of my actual birthday Ryan and I went to our favorite Italian restaurant in Vienna, Il Sestante, , where we really got to enjoy both the amazing pizza and the beautiful weather. Upon return to our apartment, we were surprised to see another number of presents waiting for me. Our neighbors left gorgeous bouquets of flowers and really nice cards at the door. So, it finally came down to this …I became a year older. Whether I like it or not, the years are just starting to go by and I guess one should also take these days with a pinch of fun. So this year, we decided to celebrate my birthday a day earlier with a BBQ lunch. Since it is considered a bad luck in Ukraine to celebrate your birthday ahead of time, the day was mostly about getting together with our friends and having a good time. 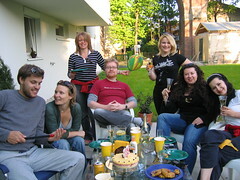 We still decorated our garden with balloons and set up two grills, one for shashlik and another one for standard grill. I was very happy to see all of my friends show up at my pre-birthday party. The weather was just perfect and it seemed like everyone had a great time. So we picked up a lawnmower this weekend, since the lawn was starting to get out of control. Since the lawn isn’t so big, we got an electric one, which needs to be plugged in. I’ve never really used one like that before, so you can imagine that it took a bit of getting used to. I borrowed an extension cord from the neighbors, and it was all I could do to keep it out of the way of the mower. Oh well, I guess it’s just something new to learn. Otherwise, though, it seemed to work fine. While I was doing all this, Svitlana planted strawberries and blackcurrants in the yard. It’s looking better all the time! Today is a pre-Easter Saturday and we decided to do some more work on our garden. Spring is in the air and all I ever want is to plant more and more. Finally I have somehow managed to convince Ryan to go to Bauhaus (Home Depot-like) to do some shopping for our garden. We bought strawberries, lavender, magnolia and azaelia bushes. Last weekend we have already started mastering our garden work with planting parts of the vegatable garden such as carrots, dill, petersil and rosemary. Let me tell ya what an uneasy task that turned out to be. Our lawn is full of grass now and so it took a lot of effort to uproot the whole patch required for planting. Today we have managed to plant the bushes and lavender and decorated all the tulips and beautiful narcissus with mulch. I really enjoyed doing the gardening no matter how tiring it was. Now we can slowly start admiring our gorgeous garden view. Click for more garden pictures. Today is one of those really gorgeous days when you finally know that spring is here. It’s the first time we can really comfortably sit outside without even a light jacket, and enjoy the weather. 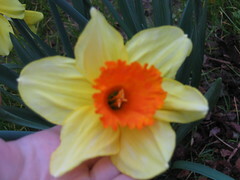 Butterflys are everywhere, ladybugs, and even the flowers are starting to really bloom. The new baby trees we have even have little buds that are ready to open up. We cleaned up the little coffee table for outside, and the garden chairs, and just enjoyed the sun. Then, we planted seeds to start our small vegetable garden. We even planted some marigolds and sunflowers, and they should be really nice when they bloom. We watered all the plants, and watched everyone going for a walk. Yesterday was a bit cooler, but still nice enough to sit outside at a restaurant and drink an Apfelsaft gesprizt, and soak up the sun. The grass needs to be cut at some point, once we get a lawnmower. In fact, I’m even posting this entry from outside, on the terrace.